No, it's not because it makes me realise how unfair our education system is, it's because it makes me realise how far the anti-intellectual movement and post-modernist society have both gone. We teach and test certain things in schools because those are the things that mark you as an intelligent member of society. In order to learn things, there are certain things you already need to know, so we test you to make sure you know them. If we were to test the specific gifts of the animals in this image, we would be wasting our time just to tell kids 'you're super special and amazing and you don't need to try to be better at anything else!'. The bird...in human terms, I suppose collecting and building their home, we don't care about...oh wait, yes we do, that's furnishing studies. The penguin...strong swimmer, who car...oh yeah, we test for that in HPE (this would go the same for the fish and seal). The elephant, really strong, caring pack animal (I think? )...hmm, sounds like someone bound for our leadership/peer mentor programs. The goat...food? Why would we care about fo...oh yeah, we have both an OP and non-OP program based around cooking, gee. But heck, when we go to test these people on their numeracy and literacy that isn't in a way that only they can do (this will almost always mean cropping things or dumbing things down or helping a lot...which is important for some students who have identified learning difficulties, but this image doesn't necessarily seem to be referring to learning difficulties, it's talking about how everyone is 'different') then we're all evil, unfeeling bastards. Please accept that if a piece of assessment says your child is not good at maths, then they're not. That doesn't mean it is beyond their ability to change that, and perhaps they will have to try harder to achieve what they want (oh no, can't have 'trying hard', natural abilities are all we should care about) and maybe get some help. I want people to stop saying it is education's fault that their child 'thinks they're an idiot'. A poor mark should only be an indicator that they need to change or try harder, the idea that this makes them stupid or less good does not come from us, it comes from the reactions parents give to those results. A bad mark is only bad if you don't learn from it (I tell my students this a lot). If a student actually tried and they got a bad mark, that's a sign they need help, extra attention, tutoring, not that they are a failure as a human being. 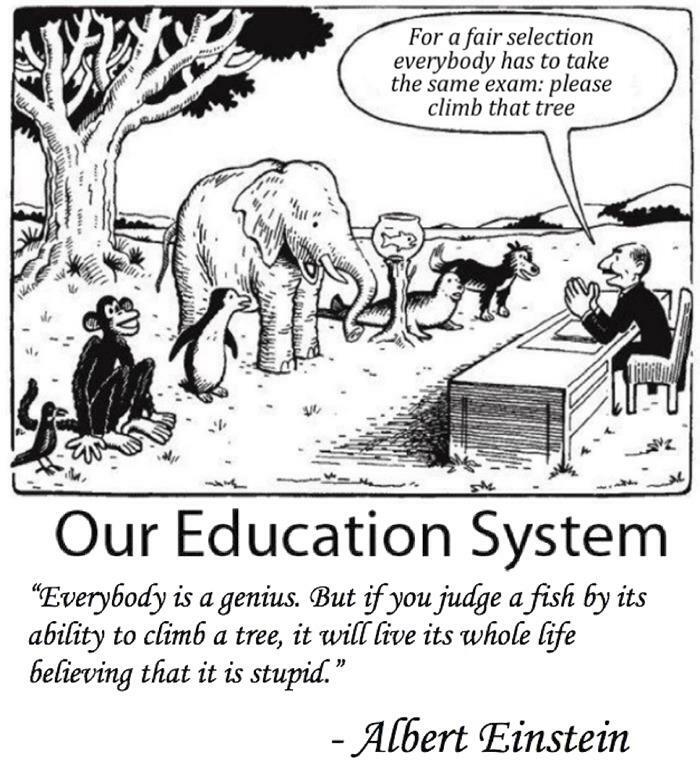 Perhaps they are 'dumb', but instead of changing the definition of 'smart', we should be encouraging students to see their other talents whilst helping them to change, to the complete limit of their still vast potential, what they want about themselves, whether it be that they're 'dumb at maths' or 'can't write'. Literacy and numeracy are things that can be developed unless you have a legitimate learning difficulty, in which case you get more specialist support and keep trying and end up making progress anyway. Don't make excuses for 'dumb', stop hating on society for wanting you to be 'smart', just try! Let's go [team name], let's go!